A new trailer for The Chronicles of Narnia: The Voyage of the Dawn Treader has gone online. Combined with last week’s new poster, I’m slowly starting to remember that this film is coming out in the near future. But my forgetfulness regarding the franchise mostly stems from the fact that I just don’t care about the property. I see this new trailer and I don’t know why I should come back to Narnia for a third time. You need to give me more than “It’s magical.” And being asked to return hammers home my biggest problem with the Narnia movies thus far: I don’t feel like the characters are part of the world as much as they’re simply tourists. They participate in the events of the world, but they’re not part of it. Maybe Dawn Treader is the movie that can turn me around on this franchise, but so far it’s just looking like more of the same. Hit the jump to check out the trailer. 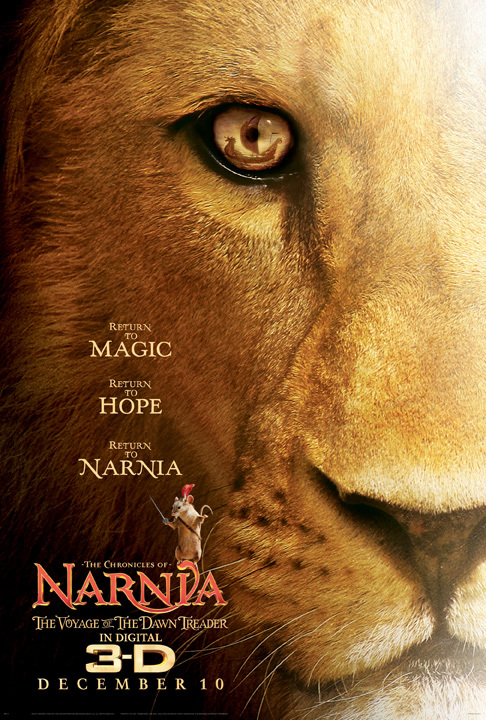 The Chronicles of Narnia: The Voyage of the Dawn Treader will open in 3D on December 10th.